Campus Martius gave Detroit a heart again. Michigan communities are leading the way in demonstrating the potential impact of Placemaking projects and in evolving Placemaking as a broad leadership, governance and development focus. The state government is now taking Placemaking to an unprecedented level as the center of their economic development and place-based governance strategy. Michigan has given PPS some of our most powerful demonstration projects. The 2.5 acre, $20 Million, Campus Martius Park in downtown Detroit has become a magnet for the revival of Detroit and has attracted billions in new investment in the blocks around it. Also starting in the late 1990s, PPS has gotten to be part of the revitalization of the now bustling Eastern Market. More recently, with the support of the Ruth Mott Foundation, PPS has completed a three-year Placemaking program in downtown Flint, and new vitality is emerging in places ranging from Riverbank Park to the Flint Farmers Market. PPS has also facilitated and led many Placemaking trainings and workshops in many Michigan communities including Midland, Harbor Springs, Traverse City, Dearborn, Detroit, Holland, Kalamazoo, Battle Creek, and Grand Rapids. Flint has begun building around its local assets. Building on these success stories, PPS has been invited to further build the conversation and capacity of Michigan communities. Giving keynotes at the Michigan Association of Planning, the Michigan Municipal League and to the Michigan Health Community and Michigan’s first Placemaking Summit. Out of work with the Northwest Michigan Council of Governments, they created a guidebook of PPS principles and tools. The guidebook won an award from the National Assoc. of Development Organizations. Working as part of a state-wide coalition to create and stimulate a broad Placemaking campaign in cities and towns, PPS led a two-day Placemaking leadership forum in collaboration with the Michigan Municipal League, Michigan Association of Realtors, Michigan State Housing and Development Authority, the Council of Michigan Foundations, the Michigan Environmental Council and the Michigan State University Land Policy Institute. The two-day event included over 100 leaders from Michigan agencies, state-wide institutions and organizations and the governors office. The leadership forum directly informed a state-run Placemaking website and led to the creation of a “Lighter Quicker, Cheaper” grants program administered by Michigan Association of Realtors. 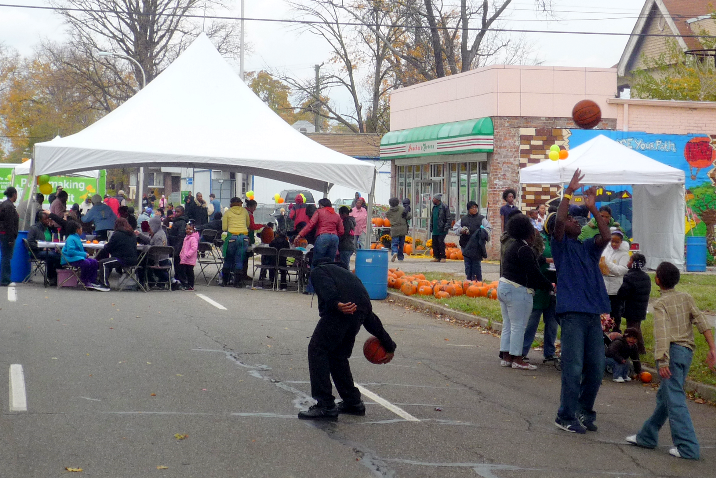 Placemaking is flouishing in Detroit neighborhoods. Detroit continues to lead innovation in Placemaking. PPS is partnering with the Kresge Foundation to bring Placemaking to low-income neighborhoods. In Central Detroit around Peaches ‘n Greens produce store with Detroit Central Christian CDC and in North Rosedale Park in Grandmont Rosedale, including the proposed relocation of the NW Detroit Farmers Market. This work has been built on with the Kellogg Foundation focusing on expanding the potential of farmers markets in three additional neighborhoods. Today, PPS is under contract with Rock Ventures, the real estate arm of Quicken Loans, and is leading a community process with D:hive to develop “Lighter, Quicker, Cheaper” improvements to three downtown public spaces that will be implemented Summer 2013 (Campus Martius, Cadillac Square, Capitol Park, and Grand Circus Park). Now, through Kresge’s support, we are also expanding this work to the Detroit Riverfront and Belle Isle Park. [See a more complete and updated list of PPS work in Detroit]. In April 2013, we held the first meeting of our Placemaking Leadership Council in Detroit attracting 330 people from 25 states and 12 countries. We look forward to continuing to learn from, and support, Michigan as it innovates around creating thriving cities that drive shared value and sustained attachment and entrepreneurship.